Windows XP comes with a firewall built in. Check your machine now and see if this is enabled and if not take a 5 minutes brake and read the rest of this article. 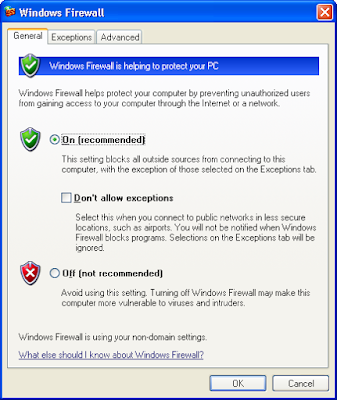 The Windows Firewall protects your network/internet connection for unwanted inbound connections such as ill intended people or automatic scanners that tries to connect/use your services. Most home users have also firewall (or some sort of NAT protection) at the router level so they decide to turn off the built in Windows firewall. This is now a good idea because if one of the other home computers gets infected, the not-protected computers may also get infected – (the threat comes from inside your network and thus is not filtered by your internet router). Not to mention that you’re totally exposed when you travel with a not-protected laptop. While Windows Firewall proves to be efficient in protecting against unwanted inbound connections, it has very limited capabilities in protecting against unwanted outbound connections. There are cases when you want to prevent a program to connect to internet. To monitor outbound connections you have to install a more powerful 3rd party firewall. A firewall with such capabilities will let you decide which connections should be allowed. For instance you want to block an auto updating software for reaching the internet or you want to know when an unknown executable tries to establish a connection with a remote site. Since these 3rd party firewalls protect both inbound and outbound connections they usually require to disable the built-in Windows firewall. There are plenty of 3rd party firewalls available. While the most known ones are commercial software, it is surprising to see that the best ones are free. 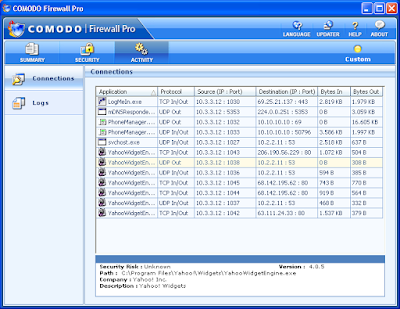 Recent reviews, made by professional publications such as PC Magazine, PC World and others, recommend the free Comodo Firewall Pro software before other commercial solutions. Feel free to use the comments form to ask any question you may have regarding this subject.